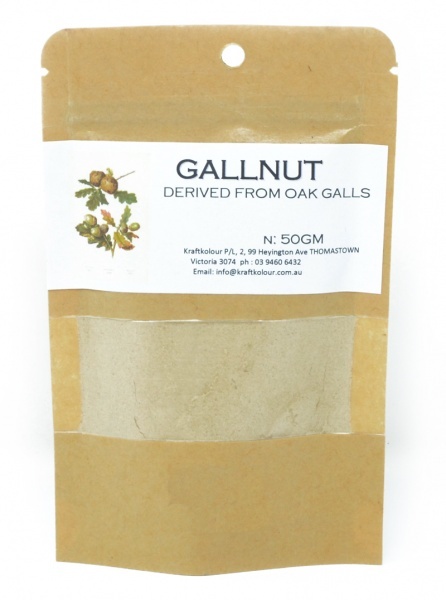 Gallnut Powder is derived from Oak Galls which are produced by Oak trees as a defence against insects which deposit their eggs in small punctures they make on young branches. The tree excretes a tannin rich gum which hardens and becomes gallnuts. This is the earliest source for natural tannin and is a colourless powder used to mordant cellulose before adding Alum. This helps the Alum bond with the fibre. Use at 6 to 8% WOF. Myrobalan Extract can also be used as a substitute for Gallnut or Tannic Acid.